Get off the beaten path and discover the Golden Isles of Georgia in a whole new way. Meander through winding trails deep inside maritime forests covered with idyllic tree canopies. Ride over the expansive marshes and take in the sweet salt air while enjoying views unlike any you’ve seen before. There are more than 50 miles of paved bike paths on St. Simons and Jekyll islands combined. We’ve pulled together biking itineraries to help you maximize your time as you scoot around the islands on two wheels. Discover the quaint charm and charisma of St. Simons Island on several newly constructed bike paths on the island. Start at the Pier Village and make your way to the north end of the island. 9:00am – Enjoy a stroll along the St. Simons Pier as local fishermen begin their daily routine of “grocery shopping” in the bountiful waters. Pedal down the sidewalk that runs parallel to the St. Simons Sound. Massive cargo ships traveling through the waters sound their friendly horn to say “hello!” to those who are outside enjoying the day. 11:00am – Opt for a leisurely ride down Old Demere Road, a picturesque route with sprawling live oak trees providing shade to those on the sidewalks. Take a quick break at the Bloody Marsh Battle Site and you’ll soon learn that the battle fought at that site was not as bloody as you might think. 11:30am – Head north on Frederica Road and hang a left into Redfern Village. This shopping and dining district is anything but cookie cutter. Find unique trinkets and treasures at Viola’s Market and Two Friends. Stop by Golden Isles Olive Oil and sample some of their 40 varieties of olive oils and balsamic vinegars. Pick out a new beachy outfit at McRobins. Shopped till you dropped? Refuel over lunch at Gnat&apos;s Landing, a casual island eatery featuring southern classics like fried pickles, shrimp and grits, and oyster po-boys. 2:00pm – Resume your route on Frederica Road as you head toward the north end of the island. About a mile down the sidewalk, you’ll stumble upon the John Gilbert Nature Trail, a 40-acre marsh-front property protected by the St. Simons Land Trust. Lock your bike into the provided bike rack and meander down the half-mile trail on foot. Stand in awe at “John’s Oak,” a 200-year-old oak tree and stop for a photo op at the viewing deck looking toward Sea Island. 2:30pm – Pedal your way farther down Frederica Road. As you come to the traffic circle at the intersection of Lawrence Road, you have a decision to make. Go right, and you’ll pass by the beautiful Frederica Stables on your way to Frederica Park. Meditate your way through the labyrinth or visit with the fairies at the fairy village. Go left, and you’ll soon see the majestic Christ Church peeking through the oak trees. Docents are onsite Tuesdays – Fridays from 2:00 – 5:00pm. Explore the hauntingly beautiful cemetery and find graves of some of the island’s first inhabitants. A stone’s throw away is Fort Frederica, the first settlement on St. Simons Island. Tabby ruins from the fort still stand today. 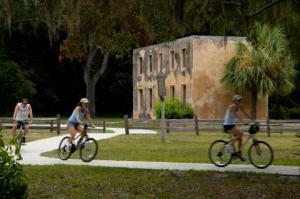 5:00pm – Reward yourself after biking around St. Simons Island, the largest island in the Golden Isles. Stop at Halyards Restaurant for Locals Hour, their version of happy hour. Partake in the drink and appetizer specials and make a few friends along the way. 9:00am – Start at Great Dunes Park, adjacent to the Jekyll Island Convention Center. Head north along the sidewalk. Along the way, you’ll be riding parallel to the Atlantic Ocean. Steady ocean breezes and soothing sounds of the waves make this an ideal area to ride your bike. Before leaving, stop by the Beach Village, Jekyll Island’s newest shopping and dining district. Grab a bite to eat, browse the shops and take in the beautiful sights and greenery. 10:30am – Continue heading North along N. Beachview Drive. Tucked away off of the road is infamous Driftwood Beach, a picturesque tree graveyard. Years of erosion has left weathered tree trunks and branches as far as the eye can see. It’s a beautiful place to hop off the bike and explore on foot. You can even see the St. Simons Lighthouse across the water. 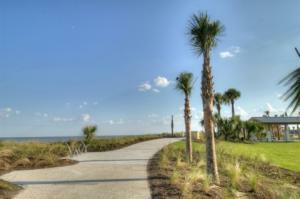 11:00am – Take the scenic route through the extended bike path after you leave Driftwood Beach. Transport yourself into an entirely different world as you pedal your way through the lush maritime forests on the way to the Clam Creek Picnic Area. Browse the fishermen’s buckets on the pier as you inquire about the “catch of the day.” Wave hello to St. Simons Island – you can easily see the southern tip of the island from Jekyll’s pier. 11:30am – As you continue your route, the road changes from N. Beachview Drive to Riverview Drive. Not far down the road, you’ll come across the Horton House, one of the oldest standing tabby structures in Georgia. Another fun fact: It is said that Major William Horton brewed Georgia’s first beer on Jekyll Island. 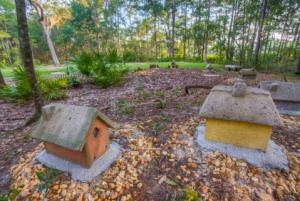 Nestled among stately trees and a beautiful view of the marshes is the DuBignon Cemetery. 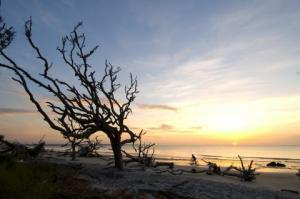 This is the final resting place for the family who owned Jekyll Island from 1790 – 1886. 12:15pm – Travel along the winding sidewalks as you make your way to the Jekyll Island Club Resort. Along the way, you’ll pass quaint homes and churches lining Riverview Drive. Cut through Old Plantation Road as you enter the Historic District. At the Jekyll Island Club Resort, you have a bevy of restaurants to pick from for lunch. Enjoy a casual, waterfront meal at The Wharf, the resort&apos;s newest restaurant. Or, opt for a yummy sandwich at the Club Cafe for a quick lunch on the go. The Grand Dining Room is the hotel’s full service restaurant specializing in seafood, gourmet specials and authentic Southern fare. 1:45pm – Resume your route in the Historic District as you pedal past centuries of history. Once a wintertime playground for the rich and famous, the iconic buildings that make up the Jekyll Island Historic District were frequented by the likes of J.P. Morgan, William Vanderbilt, and Joseph Pulitzer, to name a few. 2:30pm – Across the way is the Georgia Sea Turtle Center, a one-of-a-kind rehabilitation, research and education facility. Take time to explore their hands-on exhibits, watch a procedure through the observation window and even visit with the recuperating patients inside the hospital. 4:00pm – End the afternoon with a cold drink and an awesome view at Latitude 31. Their laid back atmosphere and welcoming spirit are contagious. Watch as boats travel in and out of the wharf while you sample one of our most beloved local delicacies: Wild Georgia Shrimp. A day spent on bikes in the Golden Isles is a day well spent. Discover new local hideouts and some of our best-kept secrets. Revel in the vast landscape and gain a greater appreciation for island time as you transport yourself to a new state of mind. 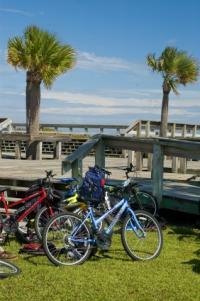 BYOB (bring your own bike) or rent a couple from one of our bike rental companies here in the Golden Isles. Be sure to practice safe biking by adhering to traffic signals, staying on the sidewalks and staying alert to your surroundings. Children under 16 are required by law to wear a helmet.